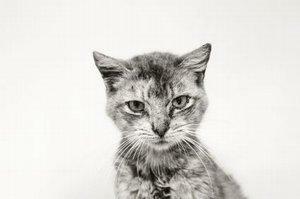 Cat skin allergies can make felines and cat lovers miserable. Learn how allergies are developed and what can be done to manage them. No cat is actually born with allergies. They are developed with repeated exposure to one or more substances that trigger a response from the cat's own immune system. This immune response is quite different from the kind of response that is mounted against bacteria and viruses. In those situations, the immune system learns to recognize the invaders and produce antibodies to destroy them. In the case of allergens, the immune system identifies a particular substance as foreign. This stimulates the system to produce a type of antibody called immunoglobulin E (IgE) which attaches itself to the allergen to neutralize it. Here lies the rub -- once the initial immune reaction has been provoked, a process known as sensitization, the allergy is established. Each time a cat is repeatedly exposed to the allergen, it triggers the immune system to produce large amounts of IgE which again link up with the allergen. These conglomerations sail through the blood stream until they encounter mast cells. During this encounter, the membrane of the mast cell is compromised, and it begins to leak a substance known as histamine. Histamine itself is the cause of the itching, swelling and inflammation associated with skin allergies. There are basically three types of allergies that produce a reaction that affects a cat's skin. Flea allergy dermatitis: This skin allergy is caused by a hypersensitivity to the saliva left behind when a flea bites the cat in order to feed on the blood. Inhalant/Contact allergies: This type of allergy is caused by inhaling or absorbing an allergen such as pollen, dander and mold through the skin. It produces a condition known as atopy or allergic dermatitis. Food allergies: An immune reaction to certain food ingredients in a cat formula also produces the same immune response and subsequent skin problems. Cat skin allergies typically produce one or more of the following symptoms that are all part of a condition known as pruritis. Most of the irritation is concentrated around the cat's head and front quarter of the body, but the allergic reaction tends to extend over the body as time goes on. Narrowing a diagnosis down to an allergic reaction is not an easy process because other conditions such as fungal infections, mite infestations, thyroid and hormonal conditions also present some of the same symptoms. Skin scrapings are often used toward ruling out other possible causes until an allergic reaction is the only reasonable diagnosis left. Once it's determined that an allergy is in play, it's time to diagnose the cause of the allergy to a) try to limit exposure to the allergen where possible, and b) determine the best course of treatment. There are several ways to determine what a cat is allergic to. One way is to analyze a blood sample for levels of allergen specific IgE's. This test can reveal numerous allergies you may not even be aware your pet has because all the allergic reactions are causing the same symptoms.Another way to isolate specific allergies is through skin testing. Step one is to inject a small amount of saline in one spot as a control. Histamine is then injected in a second spot which the vet watches to see if a welt appears. If the histamine doesn't produce a reaction, then the rest of the testing is not carried out. If the histamine does produce a welt, numerous suspected allergens are now injected, and the reactions are recorded. Any substance that produces a welt somewhere between the size of the saline and histamine welts is considered a confirmed allergen. Testing for food allergens often involves putting the cat on a hypoallergenic diet in order to figure out which foods produce an allergic reaction as they are reintroduced to the diet. Treatment is most effective when an allergy is recognized early on. The first line of treatment involves removing or reducing exposure to the identified allergen(s). Good housekeeping measures will also reduce many inhalant allergens, as well as flea populations. Antihistamines: These drugs inhibit the production of histamines. Corticosteroids: These drugs reduce itching and inflammation. Allergy shots: These injections can be customized to your pet's specific allergies to provide relief from the itching. Fatty Acid Supplements (EFA's): Although technically nutrients and not a medication, EFA's can reduce itching in some cases and help the skin repair itself faster. Additional medications that might be used include antibiotics and antifungals to treat secondary skin infections. A number of topical creams and ointments might also be applied to skin lesions to relieve itching and inflammation, bringing much needed relief. In the end, feline skin allergies cannot be cured; they can only be managed in order to reduce an affected cat's suffering. Early allergy detection is the key to keeping the problem from getting out of hand.